It is well known that L-topologies can be characterized by L-neighborhood systems (cf. Subsection 6.1 in ). The aim of this paper is to give a characterization of a subclass of L-topologies by crisp systems of L-valued neighborhoods. This subclass consists of stratified and transitive L-topologies and covers simultaneously probabilistic L-topologies and [0, l]-topologies determined by fuzzy neighborhood spaces. We present this characterization depending on the structure of the underlying lattice L. In the case of probabilistic L-topologies it is remarkable to see that the structure of complete MV-algebras (cf. [2, 12]) is sufficient, while in all other case the complete distributivity of the underlying lattice L seems to be essential. Further, if L is given by the real unit interval [0, 1], then the Booleanization of [0, l]-topologies corresponding to fuzzy neighborhood spaces exists. Hence fuzzy neighborhood spaces can be chararcterized by two different types of many valued neighborhoods — namely by Booelan valued neighborhoods or by [0, l]-valued neighborhoods as the name “fuzzy neighborhood space” suggests (cf. Remark 3.17, Proposition 5.1). 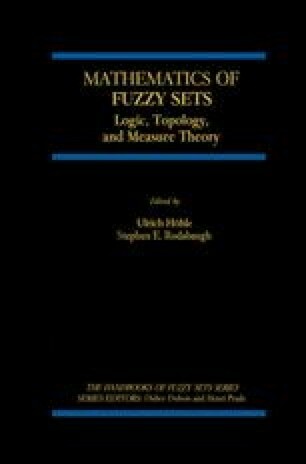 Moreover, [0, l]-fuzzifying topologies and [0, l]-topologies of fuzzy neighborhood spaces are equivalent concepts. Finally, we underline the interesting fact that a special class of stratified and transitive, [0, l]-topological spaces is induced by Menger spaces which form an important subclass of probabilistic metric spaces (cf. Example 5.6).